Black Diamond Oz Carabiner. 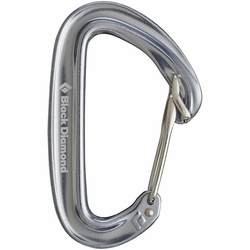 Black Diamond's lightest carabiner, engineered with an optimized geometry and the keylock benefits of BD's Hoodwire technology. Designed with an optimized shape and the snag-free benefits of our HoodWire Technology, the 1-ounce, hot-forged Black Diamond Oz is still the best way to lighten your rack. A patent-pending stainless steel wire hood brings keylock functionality to wiregate carabiners without losing the lightweight and anti-freezing benefits. And thanks to the Oz's new geometry, it holds strong as the lightest carabiner in BD's line.